Stand aside Yammer, Convo, Socialcast, Hipchat and the rest, and make way for another hopeful in the world of enterprise social networking: Stewart Butterfield, one of the co-creators of Flickr who subsequently departed from Yahoo in a colorful fashion in 2008, is today launching Slack, a platform aimed at teams of co-workers to converse, work on projects together, and share links, pictures and more in real time. This is the second service to come out of Tiny Speck, the studio started by Butterfield and other early Flickr employees. Tiny Speck first gained fame with a multiplayer game called Glitch. Glitch closed down in November 2012 after failing to gain enough user traction and failing to find a buyer. Slack is launching as a desktop, iPhone and Android app, with a responsive mobile web app in the works as well, Butterfield tells me. Over the time I’ve been writing about and using technology, I’ve covered a fair share of enterprise social networking services — from the more dry and straight variety (Microsoft’s Yammer, Tibbr, etc.) through to those who are trying to put something fun back into the mix, by borrowing heavily from the consumerization trend and the explosion of social media services like WhatsApp and Facebook (Anchor from Tomfoolery being one recent example of this latter group). Slack stands somewhere firmly in the middle of these. It’s aim — at least from the glimpses I had of Butterfield’s own network of TinySpeck employees — is very much to make work more seamless, particularly among those who don’t work in the same physical space. TinySpeck is in many ways the test case: 45 people across two offices and many remote workers. There are smart integrations — a nod to the people “scattered across different systems” that Butterfield describes — with Google Docs, Dropbox, GitHub, SVN and Perforce (Source control / repository), Twitter (Social network), Crashlytics (Crash reporting), HelpScout and ZenDesk (Help Desk), Wufoo (Form building), Nagios (IT monitoring), Trello (Project Management), Heroku (Cloud infrastructure as a service), Hubot (Messaging bot), Phabricator (Software management) and Travis (Testing / Continuous Integration). This means that users can track — and most significantly search — across all of what they may do in these different programs, once a user has created a link between files in one program and Slack. On the other hand, the service clearly borrows from some of the most successful elements that we’ve seen in social networking services very much aimed at consumers. For example on top of the search, there is a great system for tracking hashtags (effectively discussion topics) on the service, with a dedicated, always-there column of them that not only indicates the most popular discussions, but also those that are important and ongoing, and those in which you may specifically have messages. 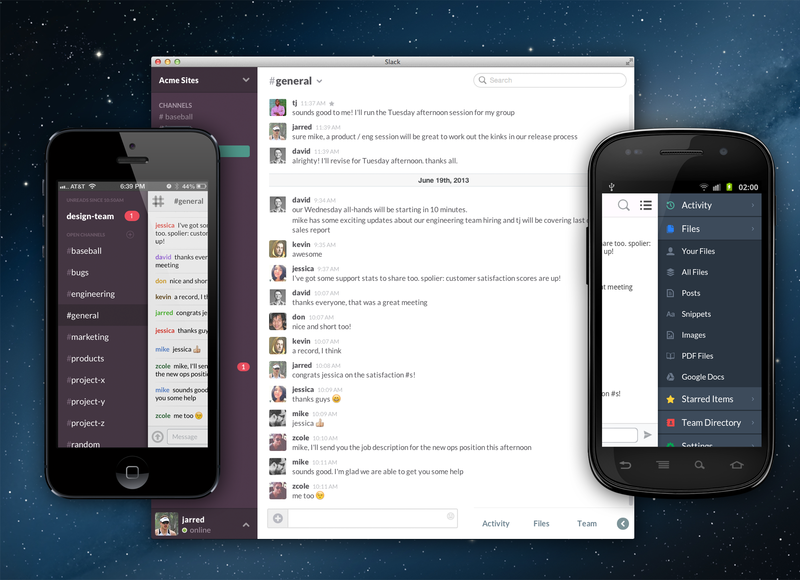 Slack for now has been trialling its service among a limited number of workgroups, 45 in all, and some interesting trends have been emerging. Email is on the decline — within three days, the company claims emails go down by 75%. Some 50 messages per day are getting shared by each person, with that including four files and six searches. “No one is giving value add on archived data,” he said in response to a question of who he saw as Slack’s biggest competitor. “Hipchat and Campfire may be the two closest products to ours, but with Microsoft’s power continuing to break down, in 10 years every organization will use centralized system to communicate if they don’t already,” and that spells an opening for Slack.